If last year's Magic Quadrant was an indication that the analytics industry was going to be driven by technological breakthroughs, we believe this year's report solidifies that trend by recognizing the next generation of BI vendors. It's February, which means Gartner's Analytics and Business Intelligence Platforms Magic Quadrant is here again. For us at Sisense, it has been quite an exciting journey getting to this point. Following two previous years of recognition in the Magic Quadrant for Analytics and Business Intelligence Platforms, we're excited that this year we've been positioned highest for the ability to execute in the Visionaries Quadrant. What is the next generation of BI? Reading the full MQ will provide you with a market overview. However, my key takeaways, and my own unless otherwise stated, revolve around augmented analytics; agility and autonomy; and the increased need for embedded analytics everywhere. "By 2020, the number of users of modern business intelligence and analytics platforms that are differentiated by augmented data discovery capabilities will grow at twice the rate — and deliver twice the business value — of those that are not." We agree that augmented analytics is the future (and present) of business intelligence, which is why for the past two years, we've invested in incorporating machine learning, NLP, and AI not only into your dashboards but also beyond the screen. For example, with Pulse alerts, machine learning algorithms in your dashboards identify anomalies and let you know when something needs your attention. The Sisense Bot allows you to have a conversation with your data in team collaboration tools like Slack and Skype; and via our integration with Amazon Echo, you can ask Alexa anything about your data and get a response with the answers you need. When we first set out, we sought to change the way people process, visualize, and digest their data. The next generation of BI users demand vendors that understand the changing role of IT within organizations and work hard to remove barriers and create both autonomy and value for everyone. "The multiyear transition to modern agile and business-led analytics is now mainstream, with double-digit growth; meanwhile, spending for traditional BI has been declining since 2015, when Gartner first split these two market segments." For those organizations with antiquated analytics software already in place, they require a vendor that can transition from on-premises hardware and deployment to an agile, self-service, cloud-based solution with an array of configurations. That's why we're excited to see that all of our efforts in ensuring that our product is set up to grow with the changing needs of the BI market — and needs of our customers — has made an impact. Greater agility isn't just about our clients, though — it's also about our clients' clients. Customers today, whether they're in healthcare, finance, industrial, retail, or any industry in between recognize the power of data. However, we know embedding analytics isn't a one size fits all endeavor. The next generation of BI is extensible, supports white labeling, and has open APIs for extreme customization. More than half of our company's revenue is attributed to organizations embedding Sisense in their own product. Companies like Nasdaq, Orion, Philips, and eTT Aviation are just some of our customers who chose to embed Sisense into their own product, monetize their data and create new revenue streams for their organizations. As more organizations begin to recognize the opportunity for innovation within business intelligence and analytics, the market is ready for the next generation to take over and change the way data is consumed. These are exciting times. Our commitment to continuing down an innovative product roadmap that will only make Sisense more robust, agile, and customer-centric is unwavering, and we look forward to pushing the boundaries to meet the needs of our customers and demands of the everchanging analytics market. 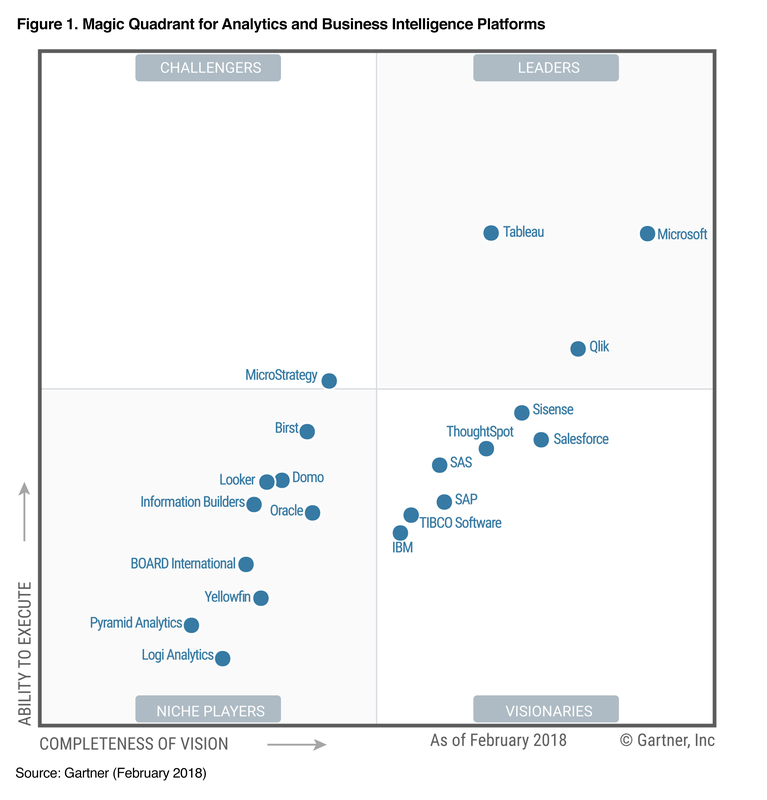 Gartner Magic Quadrant for Analytics and Business Intelligence Platforms, Cindi Howson, Alys Woodward, Carlie J. Idoine, James Laurence Richardson, Joao Tapadinhas, Rita L. Sallam, 26 February 2018. This graphic was published by Gartner, Inc. as part of a larger research document and should be evaluated in the context of the entire document. The Gartner document is available upon request from Sisense. Published at DZone with permission of Guy Levy-Yurista , DZone MVB. See the original article here.